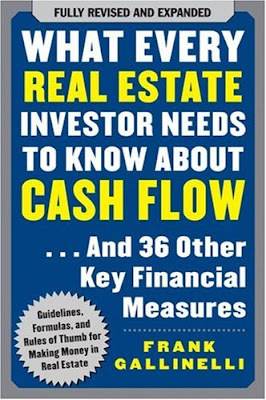 The book I read this week was What Every Real Estate Investor Needs to Know About Cash Flow by Frank Gallinelli. I feel I have gone back in time... sitting in the University library stewing over an accounting book. If I were reading an accounting book for this blog, I wouldn't even know what to tell you without risk of having you pass out due to boredom half-way through my first sentence. This will not be a long post because I will not be going in to detail on how to calculate a present value or future value formula. I will not be computing simple or compound interest and I certainly won't be laying out a amortization table. If that's something you are interested in learning you can buy an old accounting book on amazon for pennies (literally). There is no doubt that the formulas and knowledge in this book have a purpose. Even though computer programs can compute the majority of these formulas it is nice to know what is really happening and what it means. For instance, you don't need to know how to do your own taxes and create a maximum refund, but you should know the skeleton of what your tax pro is going to be doing for you and what formulas are used. For real estate, pretty much every computation that you'll ever have to do can be done in Microsoft Excel. The more familiar you are with setting up an excel formula, the easier it will be to complete your pro forma. The biggest eye-opener for me from this book were the 4 different means of making money from a real estate investment. I never thought of two of the ideas as means for making money, but they really are. I always combined appreciation and, what he calls, loan amortization in one over-arching field called equity, but it makes sense to separate the two because they can't be calculated with a single formula and can value independently of each other. The obvious ways to create money are through cash flow and appreciation. The two less looked at are loan amortization and tax shelter. Cash Flow: This is a obvious function of real estate. The fruits of your labors.... the money left over from your rent payments after mortgage, taxes, maintenance, property management etc. This is the key to any investment property. Appreciation: More often than not, real estate will increase in value over time. The difference in the building price between now and 5 years from now is the appreciation on that property. It can be due to several factors including: inflation, developing area, better school systems, crime rates and more. Loan Amortization: With your investment property, the tenants will be paying off your mortgage payment and you interest payments associated with your mortgage. That means that they are helping you buy the property. So, if you originally have equity equal to your down-payment, in 5 years your equity will be much more than that because your tenants have been adding to that. Tax Shelter: This is a means of making money through net profits. You don't directly receive any money when using an investment property as a tax shelter, but you will be paying less taxes than you normally would so you indirectly have more money in your pocket. With current regulation you have several methods of cutting back taxes with real estate. A couple include depreciation and interest. Depreciation is a funny one because even though your property is appreciating in value, you can write off the wear and tear over a certain amount of time. And you can write of the interest paid on the mortgage, which is actually being paid by your tenants. This book will stay on my book shelf as a good reference because it has plenty of formulas that might be nice to consult someday (if there is a blackout and I can't use a computer). The first chapter when the author explains evaluating properties is very helpful and a lot of the commentary about the other calculations are helpful because you can get into the mind of the seller and ensure you aren't getting "taken." I think this book could be helpful for any soon-to-be investment property investor. If you have any questions on the book don't hesitate to ask. I would be more than happy to help anyone that wants it.